Below is a picture of my 1601. Love the watch, but feel as though the bezel is a bit worn down. Do you agree? Or were the 1601 bezel's less pronounced than the newer DJ's? Either way, say I wanted to replace it with a newer, more crisp, white gold bezel, would this be possible? If so, where can I purchase/what will fit this particular watch? Thank you! There are aftermarket 14k gold, 18k gold and plated. The originals are 3mm tall these aftermarket are generally taller. A cheap stainless replacement is also available. Excellent info! Thank you. My dial was refinished. But I really like the white/gold contrast. 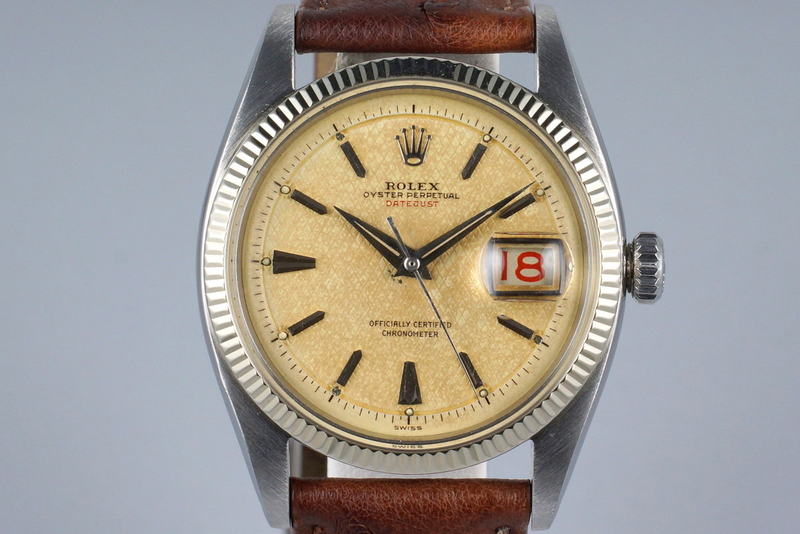 As far as I know, that font was used during the 1970's by one of Rolex's sub contractors who made the dials... but that could be bad info..In this case, do I need to find a "1601 bezel," or will any Datejust bezel fit my watch? 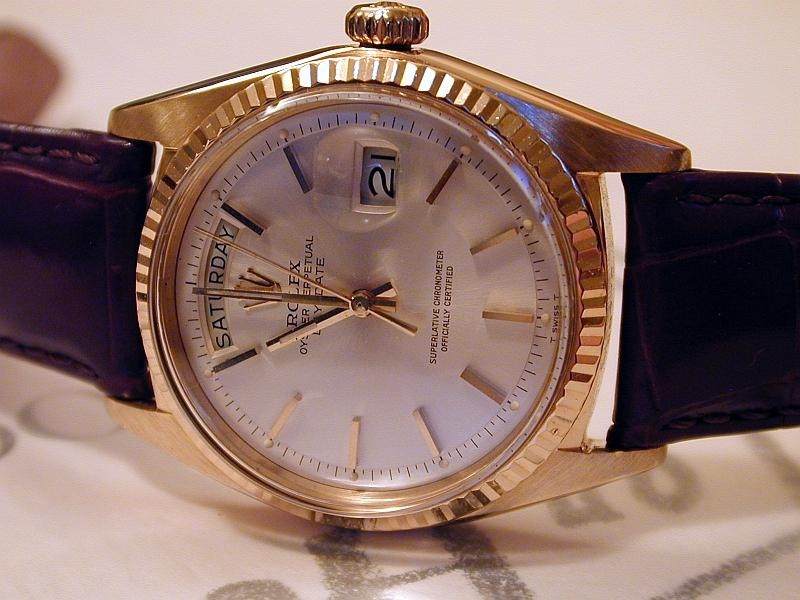 I do not plan on selling this watch so I am not worried about resale/it being ALL original. I do want to use ONLY Rolex parts though, of course. It's no sin to have a refinished dial, it's your watch. Search ebay and the forum markets for a replacement, shouldn't be too hard to come up with one. You can also run a WTB (want to buy) for one. Feel free to post what you find if you want help with the purchase. That bezel also fits an 1803 Day Date. Would an AD do the swap for me? I’ve heard they’re hesitant to work on anything that will alter the originality of the watch. They’d be happy to sell you a new bezel. If you buy one in the market it is probably smarter to go to an independant watchmaker for the work. It is something almost anyone would be able to do. Looks like Mr. Carver is in a good mood today and giving great advice. THANKS! This looks pretty sharp. Opinions? Looks like it will fit my watch too..
Did you buy it? Looks pretty good! Think I’ll make the purchase today! Would you rate that as in prettty good condition compared to mine? That would have been a good one, quite sharp. 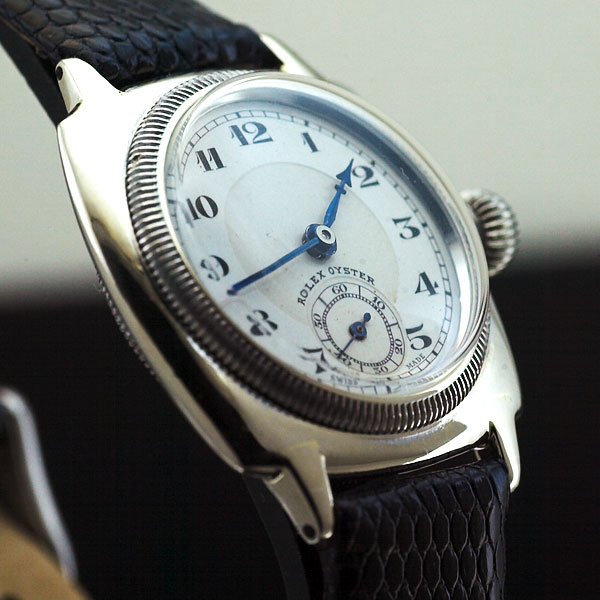 If you find a good local watchmaker they could most likely source one but probably more expensive. Very good! I saw it was gone last night and thought one of these sharks around here swiped it. :) Congrats! FWIW I still have all the original hands, dial, and bezel on my 1601 and I prefer the character of the less pronounced bezel. I suppose its the charm of the piece and if you wanted sharp and shiny then you could opt for modern examples? This is an actual coin edged bezel from the 30s, also called knurled. At that time the bezel unscrewed from the mid-case so the knurling was functional. I believe this is what you are calling coin-edged. It is a fluted bezel from the 50s but the flutes are tighter than today. This bezel has been referred to as a semi coin edged to differentiate it from the other two. And this is a later fluted bezel. Now that’s cool. So the bezel I just purchased is a later, fully flueted, correct? That’s what I am shooting for. My watch is dated 1974. Ahh yes. It ended this morning, so I bought another one he was selling. Must have re-listed it sometime today. Nice sharp bezel, great buy!